Can I call in to Blackboard Collaborate with my phone? 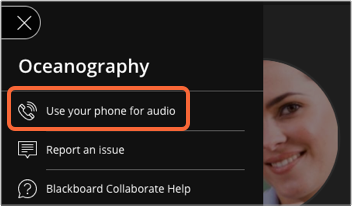 From in the session: If you have joined a session on a browser and want to use your phone for audio, open the Session menu and select User your phone for audio. Call the number listed and enter the temporary personal identification number (PIN). With this personal PIN, you appear as yourself in the session. To learn more, see Use your phone for audio while in a session. From the list of sessions: Select the name of the session you want to call into. Select the Anonymous dial-in information from the menu. Your device calls into the session. You appear as an anonymous caller to other attendees in the session. To learn more, see Anonymous dial-in. From dial-in information sent to you: Call the number and enter the Anonymous dial-inPIN sent to you. You appear as an anonymous caller to other attendees in the session. To learn more, see Anonymous dial-in.